Gas generators for sand core production are designed for a multitude of core processes; amine, methyl formate, sulfuric acid, and carbon dioxide curing systems. Their extremely efficient and economical use of curing agents, rapid curing rates, and careful attention to safety, health, and environmental concerns make them the obvious choice for foundries. Cold box systems vaporize the amine or Methyl Formate instead of atomizing it, so that they use far less of it – as little as one pound of amine cures a ton of core sand. In many cases EMI’s generators can cut catalyst consumption by as much as 50%. Reducing the amount of catalyst pays off downstream too, since less gas means fewer emissions and reducing scrubbing and acid costs. The carrier gas is ordinary shop air, therefore there is no need for costly CO2 or nitrogen. Purged air is heated internally, and there are two different purge cycles offered. An adjustable two stage type (suitable for most cores) which goes form low (5 psi) to high (75 psi), and A proportional cycle (for more delicate cores), which allows purge pressure to rise evenly form 0 to as high as 75 psi. EMI has had great success with our new Innovative and Affordable Gas Generators. When compared to more costly systems, this compact and simple gas generator delivers consistent gas delivery, an easy to set and operate system, with benefits of reduced catalyst consumption. 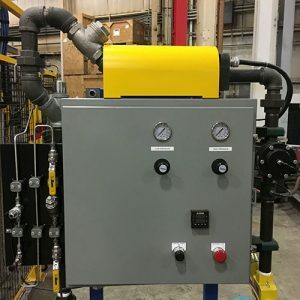 Each gas generator is uniquely designed based on the curing gas for your process. 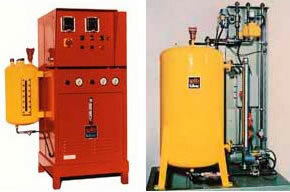 Any one of these series gas generators are pre-engineered and suitable to work with blow capacities from 30 lb to 400 lb. Contact our application specialists at 216-651-6700 or use the contact us form on this page to learn more about any of our gas generator systems.